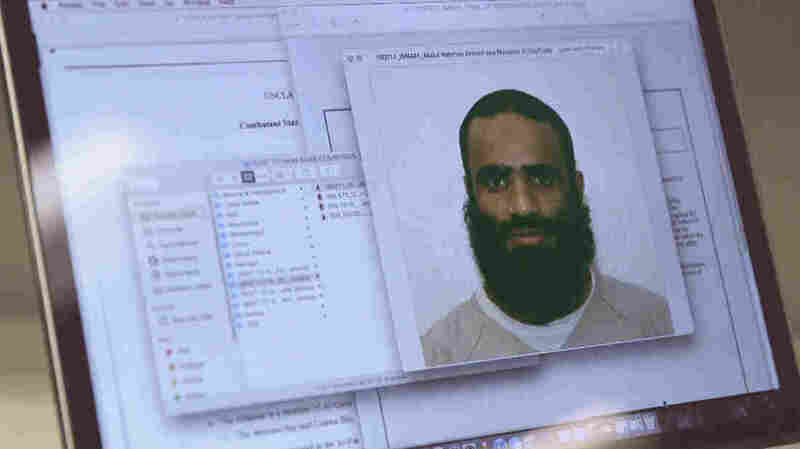 'Out Of Gitmo': Released Guantanamo Detainee Struggles In His New Home Are former detainees still a threat or just desperate to rebuild their lives? In partnership with PBS's Frontline, Arun Rath traveled to Serbia to find out why it's so difficult to relocate the men. Mansoor al-Dayfi sits in his apartment in Serbia. He was resettled there after serving 14 years in Guantanamo Bay, Cuba. In the final months of the Obama administration, the U.S. struggled to find homes for dozens of detainees in the Guantanamo Bay detention center. But the negotiations with host nations proved complicated, and five men approved for release never made it out. To understand why, I set out to interview a released Guantanamo detainee, as part of a project in partnership with the PBS series Frontline. 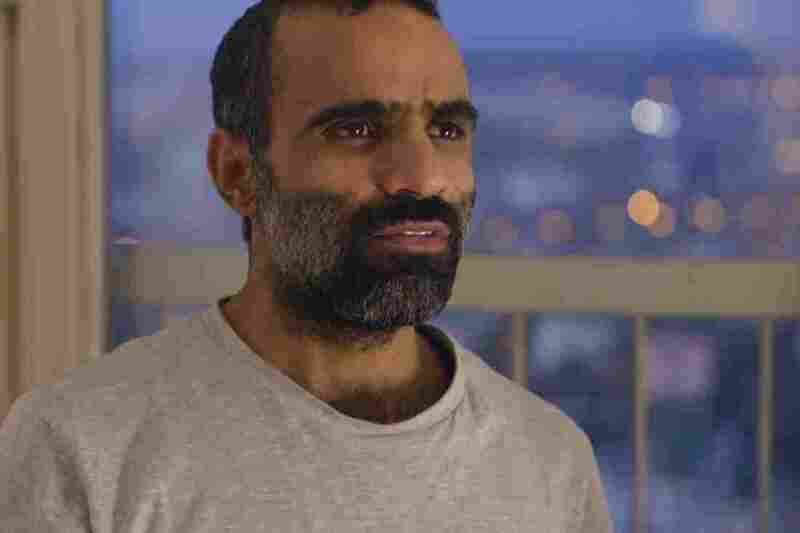 I traveled to Serbia and met Mansoor al-Dayfi, who had been sent to Guantanamo Bay soon after the war-on-terrorism detention facility was opened in early 2002. He now lives in a sparsely furnished apartment in Belgrade. It's small, but with a separate bedroom and kitchen and a living room with a nice view of the city. Dayfi is from Yemen but couldn't go home because of the instability there. So last July, U.S. officials sent him to Belgrade. The Serbian government set him up with a new life: an apartment, a monthly stipend and the opportunity for Serbian-language classes. After 14 years detained at Guantanamo, he's free. But Dayfi told me he feels like he is still in prison. "When they brought me to Serbia they make my life worse. They totally kill my dreams. It's making my life worse. ... Not because I like Guantanamo, but my life become worse here. I feel I am in another jail," he said. Dayfi taught himself English at Guantanamo, but he didn't make it far in his language classes in Serbia. He said his prospects for an education, a job, a social life and marriage are all derailed by the stigma of being an accused terrorist. He said he wants to be sent to an Arab country. To protest his conditions — just as he did at Guantanamo — Dayfi went on a hunger strike. "What I am asking [is] to be sent to another country [where] I can start my life. That [is] what I want, to start a family, start to finish my college education and to live like a normal person. That [is] what I want in my life. Not more," he said. "Simple dream. ... I hope to leave here, where I can start my life, this my hope. Where I can get some support and to either a country — other country where I can least make something of my life, move on with my life, that what I want." I had come to Serbia to find out why transferring former Guantanamo inmates deemed ready to re-enter society was so difficult. And right away I got a sense of the problem. Moments after speaking with Dayfi for the first time, I was stopped by the police and questioned. Even though the Serbian government had agreed to give him a home, it still seemed uncomfortable with an accused terrorist living in its capital city. The officials I spoke with, up to the prime minister, said the former detainee in Belgrade was adjusting well. But after our first interview, Dayfi disappeared. For two days he didn't answer his phone or his door. He then appeared at my hotel, looking terrified, with a fresh bruise on his head. He was certain he had been followed and that we were being watched in the hotel lobby, so we went to my room to talk. He told me that the day after our first interview several Serbian men wearing masks had forced their way into his apartment, and pinned him to the floor. While the others searched his apartment, the man holding him down yelled at him, saying things like, "If you want to stay here, you have to keep your mouth shut. You are lying. You are playing games." Dayfi said he felt humiliated, and he broke down as he told the story. "They told me basically just shut your mouth and I'm lying. 'If you don't stay in this place, we're going to take you someplace where you don't like,' " he said. This was a difficult situation: interviewing an ex-Guantanamo detainee hiding from authorities in a foreign country, now in my hotel room. Making the situation more complicated, we still didn't know who Dayfi really was. He was captured in 2001 after the prison uprising at Mazar-e Sharif in Afghanistan and told interrogators he trained with al-Qaida and met repeatedly with Osama bin Laden. The American government now says he was a low-level fighter who exaggerated his role to sound important. But if he has lied about being a terrorist, I had to ask him, how could I trust what he said now? He told me he did what he needed to survive. "In Guantanamo, when they put you under pressure, under very bad circumstances you are going to tell them what they want. That's it," Dayfi said. "Say, like 72 hours under very cold air conditioning, and you are tied to the ground and someone came and poured cold water, whatever. Tell him what he want. Just OK, get out of my skin. I will sign anything, I will admit anything!" Dayfi was in rough shape when I left Serbia in November and more than a dozen pounds lighter than he had been just weeks before. He finally ended his hunger strike in December under pressure from his mother, who threatened her own hunger strike if he didn't start eating. I spoke with Dayfi regularly on video calls and text messages. He said he was facing his first real winter without a proper coat. And he was still miserable. A few weeks ago, he video called me via WhatsApp on a Saturday afternoon, tearing through his apartment and ranting, "This is crazy!" He was ripping the molding off the walls, yanking out wires, and he pulled out three tiny hidden cameras — "I'm really, really pissed off. I, this is f****** enough ... really it's enough... being watched on camera in the place where I live," he said. As we were on the call, I saw armed men dressed in black ski masks walk into his apartment. Dayfi switched to the front phone camera so I could watch as they searched his apartment. The men demanded he hand over the phone he was using to record our conversation. Dayfi refused. And after a standoff, some unmasked officials who spoke English arrived. "So can you tell me why I'm being watched in my apartment? Give me one reason, am I a criminal?" Dayfi asked them. They didn't have an answer for him, but demanded his phone again. "I'm not giving you my phone! No! No, don't talk to me like this!" Dayfi screamed at the police. "Don't scare me," he continued. "Look, if I was a bad guy — " he stammered, and spat out in frustration. "I'm not stupid. I'm very smart. And very dangerous." "Very smart" and "very dangerous" — those words cut to the heart of the problem. Is Dayfi a real threat or just a desperate man pushed into a corner? That's exactly what the Serbs want to know. Dayfi told the officials that he never wanted to be sent to Serbia, he wanted to be sent to an Arab country instead. "Did you — did you know, uh, that you don't probably have opportunity to do it?" one of the Serbian officials told Dayfi. "I am following the finishing on Guantanamo; I see that Trump said that they want to rise again, something like that. They want to put a new guy inside [there]. ... It is not the same like before, one month. They start to put the wall between the Mexico and, and America, uh, two days ago ... Everything change." Eventually, there was a sense of resignation in the conversation, and almost humor. The men fell into a very cordial chat for another hour before Dayfi finally agreed to let them take his phone and laptop, which were returned two days later, Dayfi said, wiped of data. Chuck Hagel, who served as U.S. secretary of defense from 2013 to 2015, personally signed off on the release of more than 40 detainees. "We say to the host countries that are going to accept them, we want these people to get back into society, where they are productive citizens. That means education; that means rehabilitation." Ambassador Lee Wolosky, the State Department special envoy for Guantanamo closure under President Obama who negotiated the deal with Serbia to take in Dayfi, says Dayfi got a fair deal. "This is a pretty remarkable thing. An individual is picked up as a fighter by the United States. He spends a period of time in Guantanamo. And then one of our partner countries offers not only to take him in, but to give him a stipend, give him an apartment, give him language training, and to provide two years of educational support, as he tries to get himself educated," Wolosky says. Today, 41 detainees remain at Guantanamo. Ten are scheduled to go on trial in military commissions, including the self-proclaimed mastermind of the Sept. 11 attacks, Khalid Sheikh Mohammed. The rest are being held without charge. President Trump has vowed to stop releases. An earlier Web version of this story misstated former Guantanamo envoy Lee Wolosky's first name as James.